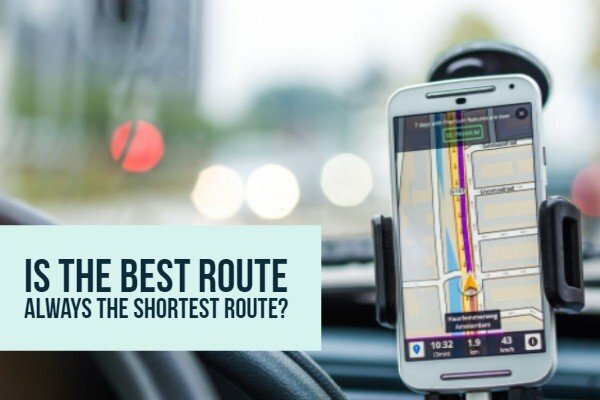 Delivery Route Planners: Is the Best Route Always the Shortest Route? FAQ – Delivery Route Planners: Is the Best Route Always the Shortest Route? Here is a quick question for delivery route planners. How do you plan the best route? First option: The best route is always going to be the shortest route. Second option: Sometimes, the best route is not the shortest route. Instead, the best route is dependant on other factors. Here is a quick advice about multiple choice questions: choices that have absolute words such as “always” are likely wrong! In this question, the rule applies and the second option is the best answer. Why? A common misconception is that the best route is always the shortest route. In reality, the delivery business is much more complicated. The following 3 examples show that delivery route planners must consider other factors. UPS bases a lot of their routes from fuel and safety rules. For instance, rather than taking the shortest distance, UPS plans their routes to avoid left turns. There are two big reasons for avoiding left turns. The first reason is safety. Left turns are particularly dangerous because drivers need to cross oncoming traffic. As a result, this increases the chances of accidents. The second reason is efficiency. Even though routes are longer, UPS is actually saving on fuel and cutting delivery time. Drivers spend so much less time waiting at traffic lights that UPS reduced its fuel consumption by 10 million gallons and saved 28.5 million miles of travel time! How does UPS plan its routes? UPS uses customized settings on their delivery route planners. A good comparison is Google Maps. On Google Maps, users can customize route preferences. In the same way, UPS can create customized routes by going into route settings and eliminating left turns. Crowdshipping is one of the newest trends in the delivery industry. Unlike traditional delivery services where full-time drivers are hired, crowdshipping is similar to Uber. Anyone can become a delivery driver for their local area. Crowdshipping provides a lot of benefits. Perhaps the biggest benefit is providing convenient consumer service. Delivery time is one of the biggest happiness factors for online purchasing experiences. Thus, it’s a huge bonus for companies to use local drivers and offer same-day delivery. For these reasons, crowdshipping is earning interest from investors and businesses. Crowdshipping already raised millions of dollars from investors and large retailers like Wal-Mart are testing the program. How are routes planned for crowdshippers? Crowdshipping might be convenient for consumers but is far from convenient for delivery route planners! One of the biggest challenges is overcoming the lack of control over contractors. Contractors have busy personal schedules, which can get in the way of getting the job done! As a result, route planners use complex software to do two things. First, the software identifies which deliverers are available that day. Second, the software should track the deliverer to ensure that the delivery is complete. 1) Customer satisfaction. Satisfied customers increases the customer’s lifetime value and keeps businesses profitable. According to studies, delivery customers prefer consistent service because they get used to a schedule and a delivery person. 2) Employee satisfaction. One of a company’s biggest assets is their employees. In addition to customer satisfaction, the same studies show that employees are proud to serve a company that has happy customers. Unfortunately, consistent service sometimes conflicts with the best route. It’s unlikely to assign a dedicated time and driver to a customer, and still have the quickest route. How should route planners balance consistent service? Most businesses prioritize better customer service over quicker routes. In fact, businesses only save 5.2% of operation cost when picking the optimal route but that amount is cancelled out by a bigger cost from losing customers and employees. As a result, businesses plan routes by adding a “time window” for consistent service. In other words, they ensure the same crews visit the same customers at the same time.